After setting a series of records through the late summer and early fall, major U.S. indexes fell sharply after early October, leaving them all in the red for the year on Monday. The S&P 500 ended the year down 6.2 percent, the Dow Jones Industrial Average 5.6 percent. On Monday, the S&P 500 added 21 points, or 0.8 percent, to 2,506. The gains were led by health care and technology stocks. The Dow added 265 points, or 1.1 percent, to 23,327. The Nasdaq rose 50 points, or 0.8 percent, to 6,635. Bond prices rose. The yield on the 10-year Treasury fell to 2.68 percent. Stocks are higher in midday trading on Wall Street on the last day of a volatile year as hopes grew for progress in resolving trade frictions between the U.S. and China. Big-name technology companies and retailers, which have been badly bruised this month, clawed higher Monday. Amazon added 2.1 percent. Traders were encouraged by news that President Donald Trump said he expected to resolve trade friction with China after speaking with Chinese President Xi Jinping. Markets have risen on trade hopes before only to fall back once progress proved elusive. The S&P 500 rose 8 points, or 0.4 percent, to 2,494. 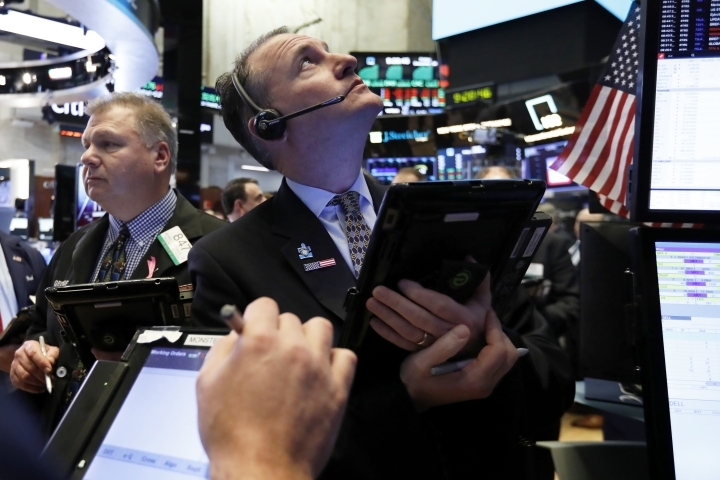 The Dow Jones Industrial Average rose 150 points, or 0.6 percent, to 23,214. The Nasdaq rose 25 points, or 0.4 percent, to 6,609. Stocks are snapping higher in early trading on Wall Street on the last day of a volatile year as hopes grew for progress in resolving trade frictions between the U.S. and China. Big-name technology companies and retailers, which have been badly bruised in the barrage of selling this month, clawed higher early Monday. Apple rose 1.9 percent and Amazon added 2.8 percent. Traders were encouraged by news that U.S. President Donald Trump said he expected to resolve trade friction with China after speaking with Chinese President Xi Jinping. The S&P 500 rose 22 points, or 0.9 percent, to 2,508. The Dow Jones Industrial Average rose 255 points, or 1.1 percent, to 23,317. The Nasdaq rose 74 points, or 1.1 percent, to 6,658.